Learn how to play the guitar with this Guitar Tuition DVD. This DVD takes you through some of the fundamental scale patterns and techniques used by many Jazz players, which will help you to widen your technical ability on the bass guitar. The lessons on this DVD will show you how to make your bass playing more melodic and will help you to understand more about improvising around chords. If you take your bass playing seriously, this DVD will help you to add a new edge to your playing, making you a more flexible and well-rounded player. 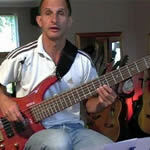 * All examples applicable to 4/5/6 string bass.